Please mail for more info on current lamp stock and prices. Left: Hand made stained glass table lamp on a very solid heavy bronze (or possibly patinated solid brass) base. Fully re-wired and pat tested. Good well balanced design and size, approx 20" high. Price £260.00 collection from shop by arrangement. Left: New large table lamp on solid brass base patinated in verdigris finish. One only. 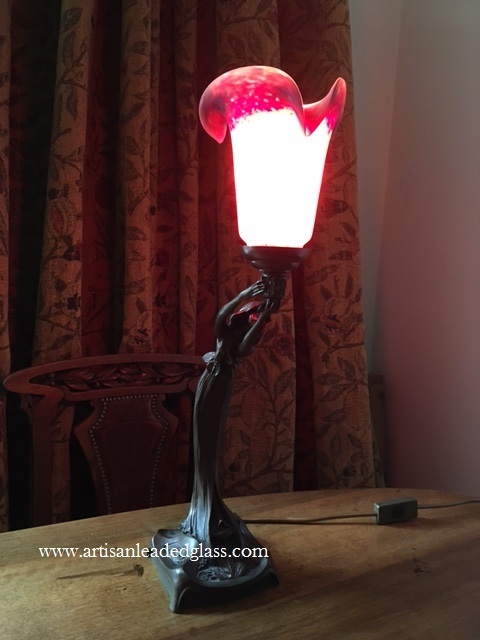 ....Left: Art Nouveau style figurine lamp with french art glass pate-de-verre shade. Shade is a rich red - photo does not do it justice. ...Left Antique Victorian hall lantern. See our dedicated antique lighting page for more details of this and other antique lanterns. 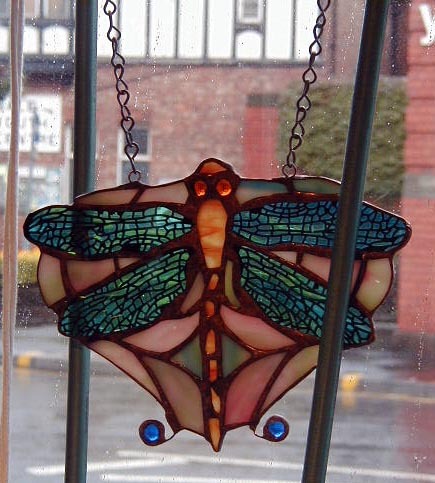 Tiffany designed Dragonfly lightcatcher - made to order in our studios -currently not in production.